The Wine Bottega has long been an institution in the North End of Boston. In October 2008, it underwent new ownership. Kerri Platt, who I previously knew from when she worked at the Lower Falls Wine Co., is the new owner and you should check out an interview with her over at Drinks Are on Me. Kerri is very passionate about wine and has brought that passion to The Wine Bottega. You definitely should stop by the store and check it out. Kerri has not made too many changes to the store, but those that she has made have been very positive. She created a website for the store, which it did not have before. The website has a blog, lists of events, recommended wines, and much more. It is well written and you should take a look. Though she has maintained their regular Friday night wine tastings, from 5pm-8pm, they have been holding numerous special events on other nights as well. I suspect that any additional changes will only enhance the store. I recently attended one of those special events, a Sherry tasting. Sherry is definitely an underappreciated wine yet it deserves more recognition. Part of the problem is that too many people have a negative image of it, yet those preconceptions are not accurate. Sherry is a complex beverage and comes in a number of different styles and flavors. More people need to try some Sherry, to find out what it is really all about. This tasting was excellent as it gave you a good idea of the range of Sherries. Plus, it was good that they provided a range of foods to have with the sherries, as they often benefit being paired with foods. I have found more people enjoy sherry with food than those who enjoy it just on its own. We began with the Emilio Hidalgo "Panesa" Fino ($16) which is a "fino," a dry sherry and which has a tiny production. It is made from 100% Palomino, and I found it to be bone-dry, elegant and with a nutty taste and some floral notes. An excellent apertif with almonds, cheese, olives or similar items. Next up, the Bodegas Hidalgo La Gitana Manzanilla ($13), which I have tasted before and found to be excellent. It is dry and mellow sherry, with a nutty flavor and a touch of saltiness. I think this makes a good introductory sherry for people has it is a bit mellower. It does benefit from being paired with food, and at this price is a very good value. We then moved onto the Bodegas Hidalgo Napolean Amontillado ($18), one of my favorite styles of Sherry. I love a glass of Amontillado after dinner. This sherry was nicely complex with flavors of caramel, nuts and hints of saltiness. It had a long finish and was very pleasing to my palate. It is dry rather than sweet and you could drink it as an apertif if you wanted. The Emilio Hidalgo Marques de Rodil Palo Cortado Especial ($46) is a special sherry. A Palo Cortado begins as a fino but the undergoes oxidation so it then resembles more an oloroso or amontillado. This sherry is made from 100% Palomino. It is a light wine but with plenty of flavor, roasted nuts, caramel and vanilla. Complex, smooth and with a lengthy and satisfying finish. Just an exceptional sherry that is well worth its price. The Emilio Hidago Gobernador Oloroso Seco ($30) has been aged for twenty years. It reminded me of the Palo Cortado except it was not as complex or good. It still was a delicious sherry, lots of nut and caramel flavors, but it paled in comparison to the Palo. It was also a little bit sweeter than the Palo but still fairly dry. This Sherry is worth its price, but I would spend more and get the Palo. The last wine was the Alvear Solera 1927 ($26) which is made from the Pedro Ximenez grape. This wine is not officially a sherry as it is made in the Montilla Morales region and not in Jerez. It has a dark orange/brown color as well as a nose of oranges. It is a sweet wine, though not cloyingly so, with a taste of raisins, vanilla, and a bit of smokiness. It is a complex wine with a lingering finish, and probably would be best paired with dessert. I recommend that you stop by The Wine Bottega, especially to check out all their special tasting events. It is a great place to find excellent Italian wines, as well as special wines from all over the world. We all love a bargain, especially now in these tougher economic times. I have previously mentioned a number of restaurant deals and now I have another, as well as deals on other interesting items too. Groupon, a deal-a-day website which began in Chicago, launched Groupon Boston last month. Groupon offers one special deal each day, offering discounts on Boston goods, services and culture such as meals at fine restaurants, tickets to cultural events, spa packages and more. It uses the power of group purchasing to create these bargains. It is free to sign up for Groupon so there is little reason not to do so. Once you sign up, you receive an email each day about the new discount. The only catch is that you will only receive that discount if a sufficient number of people sign up for the discount that day. The discount lists the number of people who must participate, and it seems to have run from 25-35 people or so, which is not really many. So far, there have been 11 different deals, three which have involved restaurants and food. First, $20 got you a $40 voucher to Zolalo Cocina Mexicana. Second, $5 got you a $10 voucher to Figaro's Delicatessen. Third, $50 off a lobster feast that is delivered to your door. Some of the other deals concerned massages, dry cleaning, car washes, and more. As many of the deals are around 50% off, you can find some good bargains. I looking forward to each different daily special and think it is worth signing up for their free email notice to find out what discounts are available. I am sure at least a few of the discounts will appeal to you and you can save money. You have nothing to lose. I always look forward to opening a new Saké, one of those I purchased from Sakaya in New York City. I continue not to be disappointed in any that I have tasted, and have also found some exceptional ones. The other night, I found another exceptional Saké and I will have to find more of it. The Shimeharitsuru “Jun” Junmai Ginjo ($32-720ml) is from the Niigata Prefecture. It was made from Gohyakumangoku ("Black Dragon") rice, that was polished to 50%. Though this Saké is labeled as a Ginjo, it technically could qualify as a Daiginjo due to the amount of polishing. This Saké has an alcohol content of 15.5% and a Saké Meter Value of +3, which means it tends to be more on the dry side. This Saké was essentially clear in color, almost looking like water. It had a very mild nose, with a slight aroma of tropical fruit and rice. When I tasted it, I found it to be silky smooth, clean and pure. It was a bit full bodied with subtle and complex fruit flavors. The finish was long and clean, such a pleasing and refreshing drink. I paired this Saké with a panko-crusted Tilapia in a black garlic-butter sauce. The Saké went well with the slightly sweet taste of the sauce and the moist, flavorful fish. As "Jun" means "pure," it is a very apt descriptor for this Saké. I heartily recommended this Saké and I think it would please those who already love Saké as well as those new to Saké. This would be good whether you drank it on its own or paired with food, especially seafood. I am going to be thinking about this Saké for quite some time. The theme for Wine Blogging Wednesday #56 has now been announced. The Corkdork is this month's host and he has chosen an appropriate seasonal theme, Fine Kosher Wine. Your task is simply to taste a "fine" Kosher wine. But this means not just any Kosher wine, not some of the generic alcoholic-grape juice that is out there, but only the best. Such wines may not be easy for everyone to locate, though there are some available online resources, such as Israeli Wine Direct. You can check out The Corkdork's post for more information about Kosher wines. On or before Wednesday, April 15th, post your tasting review on your blog and then email the link to your post to thecorkdork@gmail.com. If you lack a blog, just add your review as a comment to the original post. I have a fascination with the origins of words, as well as with unusual words. It amazes me the source of some words, the intricate path they follow to our current language. It can be interesting to see what certain words mean, or at least their original meaning. That is why I recently purchased The Dord, The Diglot, and an Avocado or Two by Anu Garg. 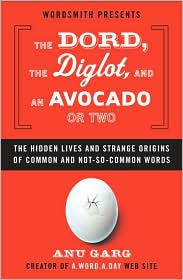 It is a fascinating book about the origin of a wide variety of words, including an entire chapter on food-related words. Are you a deipnosophist? You probably would like to be one because it means a "good conversationalist at meals." Who doesn't want to be able to speak well at dinner? The term derives from two Greek words, deipon ("meal") and sophist (wise or clever man"). Have you heard of aristology? It has nothing to do with your sign or the stars (that is astrology). Instead, it means the "art or science of dining." It is another word that derives from two Greek words, ariston ("breakfast or lunch") and logy ("science or study"). Did you know the origin of the term avocado? It originally comes from the Aztec language Nahuatl where the term was ahuacatl, which means "testicle" as that is what they felt the shape of the avocado resembled. The Spanish adopted the word but changed it to aguacate. And that came down to us as avacado. The cantaloupe melon derives its name from a papal villa, Cantalupo, located near Rome, where the melons were first grown in Europe. Macadamia nuts were named after John Macadam, an Australian chemist of the 19th century. For much more of these fun facts, check out this book. The best way to learn about Israeli wines is to taste them. My own recent tasting experiences with Israeli wines have been very positive. The second best way to learn about Israeli wines is to read about them, to learn about their wineries, wine makers and more. When seeking out such information, there is a single book that stands out. the wine and restaurant critic for the Israeli daily newspaper HaAretz and for the Israeli version of the International Herald Tribune. He also writes food and wine articles for other newspapers, magazines and books. He is considered the expert on Israeli wines. 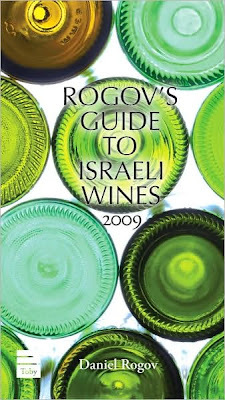 The 2009 edition of Rogov's Guide is the fifth such book and its 528 pages contain plenty of information about Israeli wine, including reviews of almost 1800 wines. It is a hardcover but only the size of a paperback book, making it easy to carry around. The Introduction has plenty of basic information including a history of wine in Israel, their current status of wine production, Israeli's grape growing regions and varieties, vintage reports from 1976-2007, kosher wines, and a few top ten lists. This will give you an excellent overview to the Israeli wine industry. Most of the Israeli wines I have tasted, and enjoyed, are obtainable through Israeli Wine Direct. They currently represent about ten boutique wineries, and a number of them are on Rogov's Top Ten lists. For example, four of the wineries they represent are on Rogov's Ten Best Wine Producers list. The bulk of Rogov's Guide is an alphabetical listing of over 140 Israeli wineries. Each listing provides some brief information about the winery and then tasting notes, drinking windows, and scores of their wines. Rogov uses the 100 point ranking system and discusses the use of such scores later on in the Afterword. Like Robert Parker, Rogov states that the tasting notes are much more important than the scores. The rest of the Afterword contains a guide to tasting wines, a glossary of wine terminology and contact information for the wineries. This is certainly a very comprehensive guide, though I would have liked to see more information about each specific winery. Generally, Rogov provides only a paragraph of facts and background about each winery. But, as he usually provides the website url for each winery, you can easily find more information if you want. The guide has tons of wine reviews and they give a great overall picture of the expanse of Israel wine production. It is an easy guide to use and has numerous wine labels throughout, adding color to the book. If you want to learn more about Israeli wines, this is an excellent resource and one I recommend. For the price, this is a very good value that is stuffed with plenty of information. I am unaware of any other resource that contains as much information about Israeli wine. Learn about one of the hottest, upcoming wine regions and check out Rogov's Guide. Robert Parker remains a controverisal and powerful individual in the wine world. I always find it intriguing to learn more about him, especially through interviews. So when I learned of a new interview with him, I was pleased to check it out and I would recommend it to others too. The new interview with Robert Parker can be found over at Bitter Lawyer, a site that states: "Our singular goal is to create an engaging, insightful entertainment destination for lawyers." This is not the usual place you might visit seeking wine information but there is a clear connection as Parker began as an attorney. The interview delves into his life with wine, but also touches on his life as an attorney. I think you might learn some new things about Parker from this Q&A as I certainly did. For example, Parker's 100 point wine rating system was used at the University of Maryland Law School. You'll learn what wine Parker drank when celebrating leaving his law job. Parker also presents some general recommendations for economical wines. And one of Parker's last statements in the interview really resonates with me. "But if you pursue your greatest passion, chances are you will not only become very good at whatever that passion is, but by being good, you will also love what you are doing, and probably make a sufficient amount of money to live very comfortably." RESERVATIONS: Required; please call 617-385-4300. The Wine Shop of Reading has always had a special place in my heart. It was one of the first wine stores to really captivate me, partially due to the passion of its owners, Robyn and Dion. I went to many wine tastings there and found plenty of interesting and delicious wines. Plus, I have savored many of the cheeses they sell, as well as other gourmet foods. It was a warm and welcoming wine store, a place where you would not feel intimidated. Unfortunately, Robyn and Dion have sold the Wine Shop and it is now under the new ownership. I understand their reasons for selling and ardently wish them the best in their lives. For seven years they have run this store, and it is now time for them to depart. Though they will help out with the transition for a time, assisting the new owners. Plus, I am sure they will eventually take up new endeavors, likely something to do with wine and food. So what does that mean for the Wine Shop? What changes will occur? The new owners, Beena and PJ, do not plan to change anything. They love the store as it is and will even keep the current employees, the women who you have seen there over the years. You should be able to find all of the same items, the cheeses, gourmet foods, giftware, and more. Robyn and Dion believe in the new owners and feel they will maintain the integrity of the shop. So you should not fear that the Wine Shop will change beyond recognition. There will be a wine tasting this Saturday, from 3-5pm, of some new arrivals. Robyn will be there so it will be a good opportunity to see her, to wish her the best. It will also be a good opportunity to meet the new owners, to get to know the new faces who will now be at the store. I am planning to stop by so hope to see you there too. In the battle of North vs South, which side prevailed? Rémy of The Wine Case, host of Wine Blogging Wednesday #55, has now posted a comprehensive roundup of the event that is well worth checking out. Thirty-three people participated, including three for the first time. Rémy provides some interesting stats on the event, breaking down the types of wines, grapes and locales that were reviewed. He even draws the conclusion, based on all the reviews, that climate rather than strict geography matters most for wines. I would fully agree with his sentiment. It was fascinating to read many of the WBW entries and Rémy provides a nice recap of each entry. I encourage you to read his recap, and then check out the full entries at the various blogs. It also appears that WBW #56 will deal with Kosher wines! KO Prime, Andrew Rimas & Beef! Carnivores have taken their lumps lately, as “recession” menus in restaurants across America are forced to trim their use of quality beef due to its stratospheric price. The sad result is a surfeit of poorly camouflaged cheap cuts, chicken ala Everything, and pasta by the pound. Consumers have found that they’re trading today’s deep discounts for yesterday’s deep satisfaction. A few bold places, however, like Boston’s KO PRIME, still offer the ultimate dining luxury: generous cuts of organic, sustainable, USDA beef, cooked to perfection and creatively garnished, thanks to the ingenuity of James Beard Award-winning chef Kenneth Oringer. 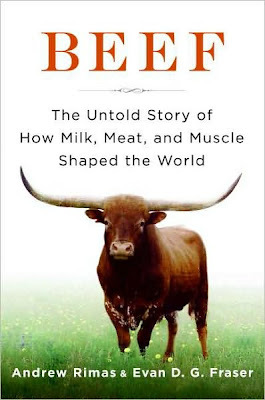 Newly-published author Andrew Rimas is a fan of Ken's and KO PRIME, and will appear at the restaurant on Thursday, April 23 ay 6:30 PM to talk beef with Ken, and to read excerpts from his New York Times-reviewed book Beef: The Untold Story Of How Milk, Meat and Muscle Shaped the World. Autographed copies of the book will be sold on site. Reservations are available online or by calling the restaurant direct at 617-772-0202. We do not make these wines, they are made only by nature. That is a paraphrase of the words of Mario Zanusso, the son of Ferdinando Zanusso, co-owner and winemaker for I Clivi, an Italian vineyard and winery. It is their wine making philosophy and has successfully led to the creation of some excellent wines. Recently, Eileen Wright of Adonna Imports brought Mario Zanusso to Wine••Sense, Samanta's boutique wine store in Andover, to showcase some of their new wines and vintages. Last year, I had the pleasure of meeting his father, Ferdinando, and tasted some delicious and impressive wines. You can check that prior post for additional background information about I Clivi and to see my previous tasting notes. In short, Mario and Ferdinando make organic wines, from old vines, in the Friuli region of Italy. They are a very small producer, making only about 2000 cases each year. Mario was very out-going, personable and obviously passionate. Though his father possesses that same passion, he is more introverted, seemingly almost shy at times. Mario stated that great wine is made from three elements: soil, grape and climate. He excludes the wine maker from that equation, believing in minimal intervention in wine making. These are intended to be wines of purity and character and I think they succeed. They use little oak for their wines, generally only for their reds, preferring to let the fruit shine forth. Part of the reason for this is that they are trying to establish a standard for their terroir. They lack a lengthy history like France so they must work at gathering evidence for the nature of their terroir, to determine the type of wines they best come forth from that terroir. The use of oak could mask the flavor of the wine, concealing the effects of the terroir. The first wine of the tasting was the 2004 Clivi Brazan Bianco. I had previously tasted the 2002 vintage and Mario mentioned that 2004 was a cold, but interesting, vintage. This 2004 Brazan was made of all Tocai Friuliano. Previous vintages had small portions of Malvasia Istrianna but the winery is moving more toward single varietal wines. This wine surprised me as it seemed fairly different from the older vintage. The 2004 actually reminded me of a Manzanilla Sherry because it had a strong, salty flavor. It had plenty of acidity and was a very elegant and intriguing wine. This would make a great food wine and certainly is more unique. Next up was the 2004 I Clivi Galea Bianco. I have previously tasted the 2003, 2002, 1999 and 1997 vintages so it was fun to taste another vintage, to see how vintage can matter to the taste of a wine. This 2004 Galea was made of 100% Tocai Friuliano though previous vintages had small portions of Verduzzo. This was an earthier wine but with delicious tropical fruit, spice and honey flavors. It was a full bodied wine, fat in your mouth. Compared to previous vintages, I think this was a bigger wine with more fruit flavors than spice or honey. Another excellent wine for food. The 1999 I Clivi Galea Bianco was also at the tasting. This was my favorite wine of the previous tasting and it was still superb. I even bought more of this wine as it was just so delicious, a complex wine with plenty of character. What really fascinated me was that Mario recommended this wine with both duck and lamb. I thought this wine would pair great with foie gras but had not considered duck or lamb. A white wine might not be your first choice either for those dishes, but it may be worth a try. Next up was a new wine they were now producing, the 2004 Bianco Degli Arzillari Venezia Giulia I.G.T. This is a field blend, mostly old vine Verduzzo Friulano, an indigenous grape that is most well known in sweet wines. This was made to be dry wine though. It had a dark yellow, almost orange, color and smelled most like apricots but will a tinge of floral notes. It is an almost austere wine but with interesting exotic spice, peach and lemon flavors. It had a long finish and certainly had a more unique flavor profile. It was a wine that made me think, trying to discern all the flavors within it, savoring how different it was from many other whites wines. The red wines were next, starting with the 2000 I Clivi Galea Rosso, which I previously tasted and enjoyed. This was followed by the 1999 I Clivi Galea Rosso, which was said to be a younger wine than the 2000 vintage. Younger? Well, 1999 was very hot so this wine, only recently released, seems like a younger wine than the 2000. It did seem a brighter wine, more fruit forward with delicious cherry and raspberry flavors. Yet you can see the potential of this wine, that there are depths to it that have yet to develop. There are hints of spice and it already has a fairly long finish. I am very interested how this will evolve over time. The wines of I Clivi are well worth seeking out. They give you the opportunity to taste wines that have minimal intervention, which are indicative of terroir. The wine makers are very passionate and truly seem to care about producing quality wine. These are the type of wines that really ignite my own passion and I hope you take a chance and try these wines. Truro Vineyards opens for the season on April 3rd. They will celebrate their opening weekend (April 3-5) with complimentary tastings for all guests. Their hours of operation in April will be Fridays and Saturdays (11am-5pm) and Sundays (12pm-5pm). They will be closed seven days a week. They have three new wines they will be releasing over the next few months. Their Estate Chardonnay (their first ever estate wine) is rich and buttery, with hints of vanilla and oak. The Estate Chardonnay label, painted by Mark Melnick, is of their old farmhouse and the beautiful Chinese Mulberry tree that has stood in front for almost 200 years. In celebration of the town of Truro's 300th birthday, the winery created a red and a white wine called "Truro 1709". The white wine is a Pinot Grigio, which is crisp, light, fruity and versatile. The Merlot is a soft, round and lovely red, with notes of red plum and cherry. The label for the 1709 series is a beautiful painting, also of the Highland Lighthouse, by Truro painter Robert Cardinal. 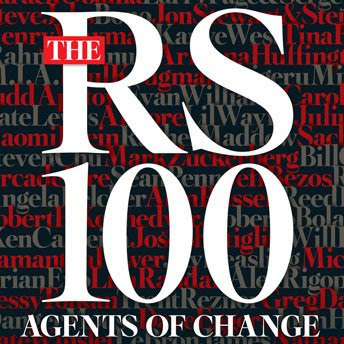 Who are the people who are reinventing America, bringing change? Rolling Stone magazine (4/2/09 issue) answered that question, presenting 100 people who they felt were doing so. It is an interesting list that is sure to provide plenty of fuel for discussion and debate. Some of the names are quite predictable, such as Barack Obama and Steve Jobs. Other names might be unfamiliar to the common person, like Shigeru Miyamoto, chief designer for Nintendo. What interested me though were the food-related individuals on the list, and only three such people made the list, including an author, chef and scientist. First, at #69, is Michael Pollan, who is referred to as "The one-man think tank of the local-grown-foods movement." He is the author of such books you may have read as In Defense of Food: An Eater’s Manifesto and The Omnivore's Dilemma: A Natural History of Four Meals. His ideas have certainly percolated throughout the food community. Second, at #78 is Chef David Chang, who is referred to as "The radical chef influencing everything from fast food to fine dining." and the "Keith Richards of food." He is the chef and owner of three New York City restaurants: Momofuku Noodle Bar, Momofuku Ko and Momofuku Ssäm Bar. Though I have not yet eaten at his restaurants, they are on my short list for my next visit to New York City. And I have only heard raves from those who have gone to his places. It is quite an honor to be the only chef on this list. Lastly, at #93 is Wes Jackson, who is referred to as "Plant geneticist fights to avert a global food crisis." He is a leader in the sustainable agriculture movement and is working to modify certain plants like wheat and sorghum into perennials. I have not heard of Wes before though I am going to learn more about him. His work does sound fascinating. So what do you think? Should these people be on the list? Are there other individuals in the food industry who belong on this list? The second volume of the Oishinbo series is Saké, though the book covers other alcoholic drinks too, such as Champagne and Beaujolais. I enjoyed this volume even more than the first one. Like the first volume, this book begins with two recipes: Sansho Kombu and Beef Short Ribs in Miso. (Sansho is a type of peppercorn and Kombu is a type of kelp.) Then there are eleven chapters, most dealing with Saké but also covering some additional topics. Like the prior volume, at the back of this book are a series of notes, many dealing with Japanese terms, concerning the text. The initial chapter deals with a man who prefers wine, especially French wine, to Saké and who also thinks wines go much better with food. Yamaoka, the journalist protagonist, challenges him to a contest: a comparison of French wines, mostly whites, against various Sakés and how they both pair with food. The first foods presented include sea urchin, karasumi (mullet roe) and kuchiko (pressed sea cucumber ovaries). The Saké prevails over the wine because the wine seems to make the food taste too fishy. The Saké brings out the taste of the food much better. The reason for this result is alleged to be that wine has much more sodium in it than Saké, and those sodium compounds bring out the fishy flavors of seafood. So the book claims that white wine and seafood is not really a good match, contrary to what many experts claim. Saké is also said to go better than wine with escargot. These are intriguing claims and I think it would be interesting to set up a similar contest locally. Does Saké really pair better with fish than French white wine? Does wine make fish taste too fishy? Maybe we shall see in the near future. The second chapter presents a different man who disdains Japanese spirits, claiming that Japan lacks any good ones. He much prefers vodka, cognac and bourbon. Yamaoka then educates him about awamori, a spirit from Okinawa, and especially kusu, an aged awamori. Awamori is made from rice which has been fermented with black koji-kin and then distilled. It ages very well and there are still some 100 year old kusu around. The kusu so impresses the man that he now accepts that Japan has a spirit to equal or rival those of other countries. We then move onto the third chapter which is an exploration of French Beaujolais, including Beaujolais Nouveau. The book is disdainful of Nouveau though very appreciative of other Beaujolais. Nouveau is said to be "more like grape juice with alcohol." There is probably little in that chapter of any controversy but it is nice to see the appreciation for Beaujolais. In the fourth chapter, we deal with Champagne. There is a man who dislikes Champagne but Yamaoka helps him to appreciate high-end Champagne, such as Dom Perignon and Krug. The rest of the book concentrates on Saké. It begins repeating the previous claims that wine is not a good pairing with seafood and that Saké is a much better accompaniement. This time they use caviar as a comparison. The next chapters use a story framework of a Saké brewery that needs to raise money to prevent defaulting on a loan. These chapters provide basic information about Saké, including how and why Saké consumption in Japan has been decreasing. You will learn about the different types of Saké such as honjozo and junmai, how rice polishing is done, brewing processes and more. All of the specific Saké brands they mention in the book are actual ones that exist in Japan. Despite the decreasing consumption, and feelings that Saké might be dying off, it actually appears there may be a new Saké era dawning. Most Saké in Japan has been rather generic and one-dimensional, nothing special. But now there are more artisan brewers, producing more special Saké. And there is a growing market for this better Saké, including Saké tasting clubs. If you don't know much about Saké, then this book would be an interesting introduction. It provides plenty of basic information and might also get you thinking about comparisons and contrasts between Saké and wine. If you already are fairly knowledgeable about Saké, you probably won't find anything new here, but you may enjoy this manga anyways. I look forward to future volumes of the Oishinbo series. Have you been to an American comic book store? You'll find lots of titles dealing with superheroes like Batman, Spiderman and the X-Men. You may see a few non-superhero titles, such as westerns or horror stores. But you probably won't see a cooking comic book. And if you did, it probably would not be a best seller. Japanese comics are called manga, and if you visited a Japanese manga store, you might be in for a surprise. 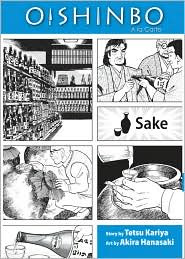 You would find manga covering a vast array of topics, including subjects such as cooking, wine and Saké. Luckily some of these fascinating manga have been translated into English and we can check them out. Oishinbo (roughly translated as “The Gourmet") is a best selling food/cooking manga in Japan. Written by Tetsu Kariya and illustrated by Akira Hanasaki, this manga was first published in 1983 and is still being written. It has sold over 100 million copies and has been collected in 102 volumes. The series was even made into a 136-episode anime television series. The premise of the story is a rivalry between two newspapers which are each trying to create a special and amazing menu. The Tozai News is creating "The Ultimate Menu" and has assigned a seasoned journalist, Shiro Yamaoka, and a young reporter, Kurita Yuko, to write the story. Yamaoka is a well-known foodie and even possesses some keen culinary skills. Teito Times is creating their own "Supreme Menu" and Yamaoka's estranged father, Kaibara Yuzan, is working the story. Yuzan is a respected and feared gourmet, as well as the founder of an elite Gourmet Club. Viz Media is publishing English translations of Oishinbo in special A La Carte editions. Rather than republish the entire series, they are instead compiling highlights into special themed volumes. Seven volumes will ultimately be published and two have already come out, Japanese Cuisine and Saké. So far, each volume is a trade paperback, about 270 pages, and costs $12.99. The books are well researched and intended to present accurate information, including recipes. Interestingly, the books have to be read back to front, like regular Japanese manga. The first volume, Japanese Cuisine, begins with two sashimi recipes: Seabream Pine-skin Style and Seabream Kamishio Style. Then there are ten chapters, each dealing with a different topic. At the back of the book are a series of notes, many dealing with Japanese terms, concerning the text. Each note indicates the the appropriate page and panel but the actual text does not indicate there is an accompanying note. So, you need to flip back and forth to gain the most benefit. In this volume, you will learn about such things as making dashi (an important stock), knife skills, cooking techniques, hospitality, etiquette, chopsticks (including how they are made), green tea, and sashimi. 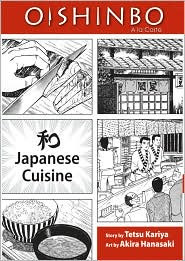 It certainly covers a wide assortment of general topics about Japanese cooking. Some of the language is quite poetic. "Etiquette isn't just about how you eat the food..it lies in the way you show your gratitude toward the ones who made it." Plus, there are comedic aspects to the story. The volume is not comprehensive but you will likely learn plenty about Japanese cuisine. I really enjoyed this manga and look forward to future volumes. I would definitely recommend this to anyone interested in Japanese cuisine. It would make a unique gift for your foodie friends. In a separate post, I will review the Saké volume. The Beehive in Boston’s South End will be celebrating Easter Sunday all day long with live entertainment, food specials, and fun for kids of all ages! Sit and sip mimosas listening to the sultry Jazz sounds of Eleanor Bianchini from 11AM – 3PM. Let the kids scurry about as they search The Beehive for hidden eggs 10AM-4PM; including a very special golden egg with a hidden prize! Can’t make it to Brunch? Skip it and come late in the day as The Beehive features a very special mid-day Jazz performance featuring The Bruce Ferarra Trio from 4:30-7:00PM or enjoy an evening Latin jazz and salsa performance by Cinco Son from 8pm to midnight. The Beehive’s regular Brunch items which includes: French toast, Eggs Benedict and omelets of all shapes and sizes. Several al a carte specialty items will be added to the menu for bunny day such as: Spring Salad with fresh pulled duck and pear ($12), Roast Leg of lamb with a Potatoes & Artichokes Hash and Arugula Salad ($20), and a Poached Salmon in Spring Pea Broth with Yukon gold potatoes ($19). The Beehive’s regular Dinner Menu will be served along with several al a carte specialty items such as: Spring Salad with fresh duck and pear ($12), Roast Leg of lamb, Potatoes & Artichokes Hash, Arugula Salad ($24), and a Poached Salmon with fresh herbs and Spring Pea Broth and Yukon gold potatoes ($22). A special children’s menu including Pasta with butter ($5) Grilled cheese ($5) and the Beehive Burger with frites and fruits ($5) will also be up for grabs. Do you enjoy Indian cuisine? One of my favorite combinations is a spicy vindaloo with some fresh naan. Or maybe some coconut soup with a dosa. If you enjoy such food, or other Indian cuisine, then maybe you should check out the Peabody Essex Museum on April 4 & 5. The museum is celebrating the art and culture of India in a weekend-long festival: Sensational India! You'll find dance, music, film, food, hands-on art activities and more. You can check out their new exhibition ReVisions, Indian Artists Engaging Traditions – featuring works of painting and sculpture contemporary Indian artists and the masters who influenced them. For families, you can hear tales from India read by storytellers, learn your fortune from a parrot and make your own finger puppets! Sensational India! is made possible by Samir and Nilima Desai; The Desai Family Foundation. For a complete list of all of the events and activities during this festival, check out their website. I am going to highlight a couple events which will likely interest foodies. --Adult Cooking Demonstration: A Taste of India. Chef Shruti Mehta creates traditional Indian dishes and shares the secrets of this aromatic cuisine. Her demonstration and stories link the art of cooking with everyday life in India. --Lecture at 2:30pm in the Morse Auditorium. Make reservations by April 3. Award-Winning Author and Actress Madhur Jaffrey is regarded by many as the world authority on Indian food. 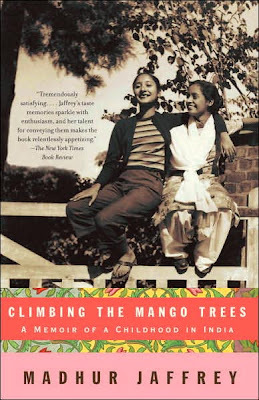 She will discuss her newest work, Climbing the Mango Trees: A Memoir of a Childhood in India, an appealing account of an unusual childhood and a testament to the power of food to prompt memory. The book includes recipes for more than 30 delicious dishes that are recovered from Jaffrey’s childhood. A book signing follows the lecture. This program made possible in part by the George Swinnerton Parker Memorial Lecture Fund. Admission: Adults $15; seniors $13; students $11. Program reservations by calling: 978-745-9500 x3011. Beacon Hill Hotel & Bistro is offering a special Pre-Fixe Easter Brunch featuring the culinary styling of Executive Chef Jason Bond. It will be served only on Sunday, April 12, from 10am–3pm. The brunch costs $38 per Person and a gratuity of 20% will be automatically added to your bill. Make your reservation today by calling 617-723-7575! Recently, I raved about a new cheese magazine that had just hit the newstands: Culture: The Word on Cheese. Their second issue is now out so I wanted to provide my thoughts on it, and tell you whether the magazine still deserves kudos. My first look at the Spring 2009 issue was promising. It was priced at only $9.95, which is less expensive than the $12.95 cover price of their premiere issue. As an additional bonus, the second issue even has 16 more pages so the reduced price did not come with a reduction of value. So what can be found within the magazine? This new issue has plenty of interesting content. You can learn how to make your own Ricotta Cheese. Check out Colorado Chef Ryan Hardy, who is also a part-time farmer, and find some of his recipes, including a delicious sounding Goat Cheese and Bacon Tart. There is a discussion of tea and cheese pairings as well as Cabernet Franc and cheese. The Centerfold this issue is a highlight of Gorwydd Caerphilly, a Welsh cheese. There is a detailed article all about Pecorino. The Mexican Cheese article interested me especially as I recently had some Cotija cheese at Toro on my corn! With all I learned about Cotija, I want to return to Toro to ask them about their source for their cheese. The local area even gets some coverage. First, there is a detailed article, Boston's Bounty, written by Clare Leschin-Hoar (who I recently met at a Boston food event) which lists local restaurants, bars, and stores with good cheese selections. This is an excellent, albeit incomplete, resource for local cheese lovers. For example, it fails to mention Las Ventas, which has a very good selection of Spanish cheeses. Second, there is a pictorial of Rawson Brook Dairy in Western Massachusetts. Unfortunately, this is only a pictorial and lacks any information about the dairy. There are plenty of other articles to check out too. Once again, I was very impressed with this magazine and continue to heartily recommend it to all cheese lovers. The quality has not diminished an iota since the premiere issue. I found plenty of interest within the magazine and learned a number of new things. As it is now longer, and cheaper, it makes it even a better buy. The Boston article makes this issue even more valuable to my local readers. Join The Second Glass at the upcoming Wine Riot! The Wine Riot is an expo-style wine tasting event which will be held in the South End at the Cyclorama. Over 250 wines will be featured at this wine so you are sure to find plenty of wines you will enoy. Besides the tasting, you will also have the opportunity to enhance your wine knowledge through a printed wine guide, mobile technology, free mini-seminars, and forty fantastic exhibitors, Free Crash Courses will be hosted by sponsors throughout the event, dishing in-depth knowledge about specific grapes, regions, and growing trends. VIP Night: 6-10pm ($65)--Attend this very special night of wine tastings with a panel of experts on biodynamic & sustainable wine-making practices. Session 1: 1-5pm ($45)--The first of two tasting sessions kicks off a fantastic day of swirling, sniffing and sipping. Session 2: 6-10pm ($45)--Session two takes the great sampling into the night. Crash Courses: Both of Saturday’s Riot! sessions will feature 3 different Sponsor-run breakouts, each giving twelve 20 minute “Crash Course” seminars, during which Rioters can expand their knowledge and try new wines at no additional cost. You can purchase tickets online or at certain local wine stores. This week, I joined the Restaurant Reviewers BlogRoll and you can see it on the right side on my blog within a blue box. This blogroll contains a growing list of blogs that provide restaurant reviews of places all over the world. Each listing describes the geographical areas that the site covers. So wherever you travel, you can check the list to hopefully find restaurant reviews for that area. This blogroll was created by Laura, the Hendersonville Epicurean. She states: "It's a great way for us to create a community of foodies who want to share their experiences, opinions and suggestions on restaurants where we dine." I agree with her sentiment and would recommend other restaurant reviewers join this blogroll. I think this is a good resource for my readers and I know I will find some new blogs that I have never visited before. If you have any thoughts about the blogroll, feel free to add your comments here. A clandestine dining experience on a snowy Sunday evening. I felt like a foodie spy, meeting other secret agents to assess a new target. Only the attendees knew the location of the meal, a restaurant that had been co-opted for the evening for this special event. Yet the dinner was not too secret, as it had been advertised on at least a couple websites. I actually first learned of the event from the article Try Underground Dining-O.N.C.E. The article intrigued me. Many questions surfaced in my mind. Was this event illegal? If it was, did that even matter? Would this event be sanitary and safe? Would the food be good? What type of people would be there? I intended to learn the answers. Underground dining or secret supper clubs exist all cross the country, though they vary greatly from place to place. The reasons for such also vary. They are not without controversy and some of them are technically illegal while others have sanitary issues. Yet foodies often find them intriguing, relishing the secrecy and exclusivity of such. The O.N.C.E. event certainly fascinated me and I wanted to attend, to see what it was like, despite any minor worries that I might have. O.N.C.E. stands for "One Night Culinary Events" and they are run by JJ Gonson, a personal chef and local foodie, of Cuisine En Locale. These events are run sporadically and are often very different and "seasonally appropriate." The dining events primarily use the best local foods. For this recent event, there were to be two different dinners. The first seating was for families with children, a buffet style meal. The second seating was to be a special, ten-course meal for only a donation of $50. Though they sold wine and beer, you could also bring your own. When I arrived at the event, I was warmly greeted and had a chance to speak with JJ for a bit. I found her to be very energetic and obviously passionate about food and cooking. She made an excellent advocate for the dinner, bringing an infectious enthusiasm to the room. I sat with a few food & wine writer/bloggers that I knew. You can check out their work at the Leather District Gourmet, Drinks Are On Me, and Tales of the Basil Queen. Adele has already has written an excellent and comprehensive description of the dinner. For an insider's view, you should also check out Linsey's post on this event. Linsey worked as the front-of-the-house manager for the event and you can learn much more about the preparation and service for this event. Over the course of several hours, we dined on the multi-course feast, enjoying the wines that Dale and I brought. Adele has already gone into a very detailed description of all the various courses so I won't do the same. Instead, let me provide my general feelings about the dinner in its entirety. And I will begin by telling you that I had a very pleasant dining experience. I felt that this was a very homey and comfortable dinner, like a casual dinner party you might have at your own home. The food was very good (I craved seconds of several of the dishes) and JJ is obviously a talented chef. For the donation of $50, I think this was a very good value, especially considering some of the ingredients, such as lobster and lamb. We were not rushed, service was very good, and everyone was so very pleasant. For example, one of the workers, Henry, sent over to me a couple glasses of some older Italian wines. That was a very kind gesture. The O.N.C.E. event is a good example of the potential of underground dining. You don't always have to visit a restaurant or cook at home for a good meal. You can live on the edge and seek out a different dining experience, maybe a more clandestine meal. I really liked the fact that this event was not fueled by a chef's greed but rather originated with the sincere passion of JJ Gonson. I felt a real sense of community at this event and I would not hesitate to go to another O.N.C.E. event. I definitely recommend that my readers check out these events. Just go to JJ's site, Cuisine En Locale, for information about the next event. You might also want to consider her personal chef and catering services. I am also looking forward to one of JJ's new endeavors, which I'll just mention briefly. She is assisting a Thai restaurant with a small plates concept. Now that sounds very cool and I can't wait to check it out when it is ready. Do you love Filet Mignon? Then again, who doesn't? If you do, I have a recommendation for you on April 1. On April 1, Burtons Grill will be offering a special dinner for 2 including: 2 Filet Mignons for $22 in celebration of the location's 2-year anniversary. “I guess we could have thrown some sort of party to celebrate our newest location’s 2-year anniversary, but in this climate it seemed just to make sense to do something for our customers. People have cut back on dining out and we wanted to do something that would show gratitude to our loyal customers… and also hopefully introduce our brand to new customers,” said Kevin Harron, CEO of Burtons Grill. The one-day promotion is offered only at Burton’s Grill in the Back Bay on Wednesday, April 1, from 5pm–10pm and is valid for parties of (2) that make a reservation by calling the restaurant at: 617-236-2236 and ask for the 2-Year Anniversary Special. The Special includes: (2) 9oz. Filet Mignons and (2) Baked potatoes for $22.00 (Gratuity and Tax Not Included, may not be used in association with any other discounts or promotions). Certainly sounds like a very good deal to me. Geography is important for wine as each region is unique and can impart its own special qualities to wine produced in that area. This is kind of what terroir entails. The theme for Wine Blogging Wednesday #55 has led to an exploration of this concept. The theme of North vs South gave the participants lots of leeway in how to reflect that concept and I took advantage of that leeway. I chose to compare Saké from two different regions of Japan, one in the north and one more to the south. I made sure the styles were the same, both being Daiginjos, and in addition, they both used the same type of rice, Yamadanishiki. Part of my reason for selecting Saké this was to show its wide diversity as well as show how terroir can apply to Saké too. There are 47 Prefectures in Japan, which are very roughly like states. All but one of them produces Saké, the other producing Shochu, a distilled liquor. Japan has a variety of climates, soils, and elevations, all dependent where on the island you are located. So it is only logical that these differing conditions may produce different styles of Saké. I put this to the test. This test compared the Akitabare Suirakuten Daiginjo from the Akita Prefecture with the Kamoshibito Kuheiji Daiginjo from the Aichi Prefecture. Let me begin though by explaining some terms and similarities of these two Sakés. First, they are both Junmai, "pure Saké," which means they are made with only rice, water, koji and yeast. Nothing else has been added. Second, both use Yamadanishiki rice, considered by many to be the best of all Saké rice strains. Third, they are both Daiginjos, the highest quality level of Saké that exists. At least 50% of the rice grain must have been polished away to qualify for this designation. Now let us compare the prefectures. The Akita Prefecture is located in northern Honshu, the main island of Japan, and it faces the Sea of Japan in the west. It shares the same latitude as New York. With Akita's many steep and high mountains, the climate usually consists of long winters and short summers. It also has an abundance of pure, crystal clear water that descends from the mountains. Akita is famous for its Saké breweries and its slogan is "Bishu Okoku" or "empire of beautiful Saké." Saké from Akita is said to commonly be "rich and well rounded, yet soft, with a layered, detailed construction." The Aichi Prefecture is located south of Akita, almost in the center of Honshu and is bordered to the south by the Pacific Ocean. It enjoys a rather a mild climate, and much of the land is taken over by urban sprawl. Saké from Aichi commonly has a more mellow character. Climate matters with Saké. In general, the Saké brewing season is about from the end of October to the beginning of April. This is because colder weather assists the fermentation process, which needs to occur at lower temperatures. Thus, the colder regions of Japan have a better ability to produce Saké, thus giving an edge to the Akita Prefecture. Brewers in the Aichi Prefecture may have to work a bit harder due to their milder climate. So let us now examine each specific Saké. The Akitabare Suirakuten Daiginjo ($64.99-720ml) is roughly translated as “Heaven of Tipsy Delight.” Saké names can be so evocative and who cannot love a name like this one? The rice has been polished to 38%, it has an alcohol content of 15-16% and a Saké Meter Value of +4, meaning it tends to be a little bit drier. This Saké was aged for two years after brewing, which is not common. I found this to have a very mild aroma, maybe a touch of steamed rice and melon. This was a more full-bodied Saké than I expected as many Daiginjos are light and delicate. It was rich with intriguing flavors of melon and marshmallow. It was soft and easy-drinking, something you could easily drink glass after glass. The more you concentrated on the Saké though, you found additional nuances and flavors. Yet they were fleeting and difficult to identify, though quite pleasing. A delicious and interesting Saké which should please many. The Kamoshibito Kuheiji Daiginjo ($56.99-720 ml) has a bit of a more boring name, which roughly translates as "Kuheiji the sake brewer." It has had its rice polished to 40%, has an alcohol content of 16-17% and a Saké Meter Value of +2, meaning it tends to be more neutral than either dry or sweet. The brewery has a long history, having been founded in 1647. It remains a very traditional brewery. The nose of Saké was also mild, with maybe a bit of melon. It had a lighter body and was not as rich as the other Daiginjo. It was a mellow drink, with flavors of melon and peach, and a slight hint of bitterness on the finish. Like the other Saké, the more you concentrated, the more you found in your mouth. A complex drink but I did not enjoy it as much as the Akitabare. That is due solely to personal preference and due to any defect in this one. I certainly enjoyed both of them, and think they both reflect their region well, but I simply preferred the Akitabare. Thanks to Rémy of The Wine Case who chose this intriguing theme. In addition, if you are interested in purchasing either of these Saké, I suggest you contact Sakaya, the all-Saké store in New York City, where I purchased both of these bottles. Pateria de Sousa: Ethical Foie Gras? Can foie gras be produced without force feeding ducks and geese? If force feeding were eliminated, then there would be little reason to oppose foie gras. Well, at least one Spanish farmer believes it is possible and he is producing what some call "ethical foie gras." Pateria de Sousa is a Spanish company owned by Eduardo Sousa. The 30-acre farm is located in the Badajoz province of the Extremadura region, about fifty miles north of Seville. The company has been producing foie gras for almost two-hundred years. It lacks a website so it is not easy to find information about the company. Sousa raises only geese, not ducks, and they are allowed to wander all across the farm, which they share with pigs, which Sousa raises for their meat. The geese are referred to as Ganso Iberico, or Iberian Geese. The geese are not force fed at all. Instead, Sousa waits for the geese to naturally eat enough food to enlarge their livers, which occurs at the time when they would be ready to migrate. Depending on the weather, this will occur sometime between December and February. The livers generally though do not enlargen as much as would through force feeding. Plus, this means that foie gras can only be produced once a year, making it much rarer, and thus more expensive, than other foie. Most of the foie gras produced by Sousa is pasteurized and then made into parfaits. I am unsure whether Sousa's products are available in the U.S. or not. They are available in Europe, including Britain. There is some question too whether it tastes as good as regular foie. What are your thoughts on this "ethical" foie gras? My new column of "A Passionate Foodie" can be found in the March 18 issue issue of the Stoneham Sun newspaper. This is a weekly column that concentrates on reviews of local restaurants though it also sometimes touches on other food and wine topics. The new column has been published today and is also available online. The new column is a review of Las Ventas, a new Spanish food market in the South End of Boston. Find some excellent Spanish ham, cheese and much more here. It is definitely a place for foodies to check out. Do you enjoy foie gras? Are you opposed to it, thinking it is cruel? Or do you fall somewhere in the middle, maybe unsure about the issue? Today, let us explore the foie gras controversy and set the ground work for discussion and debate. Please note that some of the items in this post come from The Foie Gras Wars by Mark Caro, a book I recently reviewed and recommended. I'll note the page numbers for the items I present. It is difficult to even phrase an initial question concerning the foie gras controversy because the phrasing might bias the answer, or the question may be ambiguous. For example, say we ask, is the production of foie gras cruel? The problem is with the definition of "cruel?" Couldn't we say that the raising of nearly all animals is cruel in some respect? As another example, we might ask whether ducks raised for foie gras suffer? But then what is the definition of "suffer?" Doesn't the raising of all animals involve suffering in some respect? Maybe instead we should qualify our questions with terms such as "unnecessary" or "extreme" cruelty or suffering. But even those definitions are likely to cause problems. Despite these difficulties, we still can have a meaningful discussion about this subject. We just may have to be more creative in how we approach the matter. For many, "Suffering remains the accepted yardsick for assessing the welfare of any "sentient being." (p.19) Yet defining that term remains a significant issue. Not everyone uses the same standards to assess it. If someone is concerned about any and all animal suffering, then they would likely have to be opposed to any raising of animals for food or other items. Yet all animals are not treated the same. So, we can at least try to compare the treatment of different animals to see which might suffer more. Hogs and cattle are also raised on factory farms, and they too have their significant share of problems, harsh conditions which lead to animal suffering. Check out Righteous Porkchop for much more information about the horrors of these factory farms. Plus, these factory farms are environmental hazards and the problems are much deeper than just animal cruelty. With such vast issues, then why should people be so vocal about ducks and foie gras? How big is the foie gras industry in the U.S? Consider that approximately 500,000 ducks a year are slaughtered for foie gras. Some factory farms kill that many broiler chickens in a single day. (p.69) So we can see that foie gras production is a very small operation. By sheers numbers, we should be far more concerned about chickens and other animals before foie gras. So why does it seem that the opposition to foie gras is so much more prevalent and vocal? For one thing, and which is quite important, because the foie gras industry is small, its response to criticisms, boycotts and such is usually equally small. They lack the mighty industries, with their accompanying wealth, that are behind chicken and pork. So foie gras is a far easier target. Rather than take on billion dollar industries, the protesters would rather take on a mere handful of duck farmers. And in doing so, these protesters ignore far greater problems. Criticism of foie gras production generally centers on the process of "gavage," the "force feeding" of the ducks and geese. I am not sure many people fully understand this process though. The term itself, force feeding, seems to carry significant negative connotations. Yet what is the reality? One caveat is that we cannot anthropomorphize ducks and geese. They are animals and don't have the same biology as humans. They don't feel the same things, in the same way, that we do. So, if we are trying to determine whether these birds suffer, we must consider such suffering from the point of view of the birds, and not how a human would view it. Ducks raised for foie gras generally spend their first 12 weeks as free range birds, and there is no force feeding done during that time. They essentially live pleasant lives and you would be hard pressed to say that they suffer in any respect, unless you are completely opposed to raising animals. As a comparison, regular ducks that are slaughtered just for their meat live for only about 5.5 weeks. Broiler chickens generally live for only about 6-7 weeks. So we can see that foie gras ducks actually live at least twice as long as these other birds. That is surely a benefit to being such a duck. After the 12 week period, foie gras ducks are moved to either group pens (in the U.S.) or individual cages (in France and Canada). Gavage will then be conducted 2-3 times a day over a period of 2-4 weeks. If the process is done over four weeks, the feeding is done more gradually. In this force feeding, a metal tube or pipe is lowered into a ducks's throat for about 2-10 seconds while the food is being introduced. Did you realize how quick this was done? How much does a duck suffer during these very brief instances of force feeding? Gavage is supposed to mimic in some respects how birds gorge themselves prior to migration. (p.6) This is a good example of why we should not anthropomorphize these birds. Unlike humans, these birds have systems designed to accomodate such over eating. There are veterinarians who support that gavage is not cruel. (p.44) Yet there remain those who are vehemently opposed to this practice. Who is correct? For further consideration, you should also read a recent letter written by the owners of Incanto restaurant in San Francisco. The letter, Shock & Foie: The War Against Dietary Self-Determinism, is a well written, cogent and compelling argument in support of foie gras. I highly recommend you read it and carefully consider its contents. So where do you stand on the foie gras controversy? Please post your thoughts in the comments. If you have written before on this subject, please post links to your articles in the comments as well. Red Oak Winery: For Sale! Would you like to own a winery? How about one in Massachusetts? If so, now may be your chance to purchase an existing winery. Today on Craig's List, there is an advertisement about a "Secured Party Auction" of a winery located in Middleton, Massachusetts. This is the Red Oak Winery. It appears that a creditor of Red Oak Winery, who has a security interest in the winery, has not been paid sufficiently and has forced an auction. The auction will be held on March 30 at 11am. The sale includes all wine, wine making equipment, furniture, & fixtures. It is sold "as is" and "where is." You can check out the ad for additional details. I have not yet been able to find any additional information about this. The Red Oak Winery site mentions nothing about the auction. Do you enjoy foie gras? Are you opposed to it, thinking it is cruel? Or do you fall somewhere in the middle, mabe unsure about the issue? Whatever your position, there are matters about foie gras that you may not know and which you might find interesting. I hope to provide some enlightment here, to point out some fascinating items about foie gras, including some things I did not know. Please note that these items all come from The Foie Gras Wars by Mark Caro, a book I reviewed and recommended yesterday. I'll note the page numbers for the items I present. It probably comes as no surprise that France accounts for about 80% of all foie gras production, and 90% of its consumption. (p.230) At numerous farms in France, you can even enjoy a special Foie Gras Weekend where you will slaughter your own duck and then make foie gras, which you can take home with you. (p.248) How many of you would sign up for such a weekend? Yes, I would do this if I had the opportunity. Tomorrow, I'll touch on matters related to the foie gras controversy, hoping to spur on some debate. This is not going to endear me to PETA, but I love foie gras. Sear me a piece of foie gras and I'll savor the crispy exterior and the silky interior. It can make such an exceptionally delicious dish, prepared in a multitude of ways. I have no regrets or moral qualms over enjoying foie gras and have no plans to stop eating it. 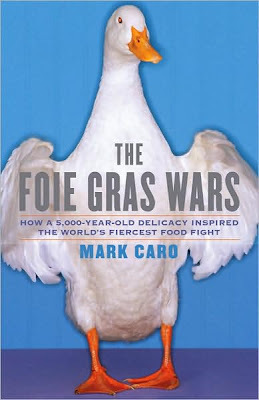 As I enjoy foie gras so much, I was certainly intrigued when I found a new book about it, The Foie Gras Wars: How a 5,000-Year-Old Delicacy Inspired the World's Fiercest Food Fight by Mark Caro (Simon & Schuster, February 2009, $25). Caro is an award-winning entertainment reporter for the Chicago Tribune. He originally wrote a front-page story about the foie gras controversy occurring in Chicago, and this eventually led to the creation of this book. Caro takes an expansive look at the controversial issues surrounding foie gras. Learn about the history of foie gras, extending back 5000 years to ancient Egypt. Visit farms in the United States and France where ducks and geese are raised for their livers. Explore the biology of ducks and geese to assist in determining whether they suffer from being force fed. Follow anti-foie gras activists on their protests. Talk with various chefs about their feelings, for and against, foie gras. Gain a better understanding of all of the issues revolving around foie gras. I found this book to be quite engaging, hooking me right from the start. The centerpiece of the book is Chicago, where foie gras was banned for a short time. Leading chefs, such as Chefs Charlie Trotter and Rick Tramanto, in the city were on opposing sides of the controversy, some being quite vocal and adversarial. Yet Chicago was not the only place battling over foie gras and Caro discusses much more than just Chicago. This is a fascinating story about an intriguing subject. Caro is a talented writer and you won't be bored with his prose. He also presents a very balanced and fair examination of the foie gras controversy. I think it will give everyone something to think about, which ever side of the matter you fall upon. I certainly learned some new things about foie gras. I definitely recommend this book. And I am going to be following up this review with additional posts about foie gras, based on information from this book. I would like to open up a dialogue on foie gras, to explore and debate the issues. As I previously stated in my Itadakimasu post, "Let us step back and think more about the sources of our food." And Foie Gras Wars is another step on that road. I returned to Caffe Italia the other night for some dinner. As you may recall, my prior visit was generally good though with a few issues. My second visit was better than the first. First, on my last visit, the rolls were over baked. This time the rolls were better, with no burn spots on them, though they still were not served warm. I then began my meal with the Pear & Gorgonzola Cheese Salad ($10) with mixed greens and arugula topped by a balsamic vinaigrette. This was a good salad, with four long slices of crisp pear and plenty of gorgonzola pieces. The balsamic was more restrained so that the salad was not swimming in it. It was a good-sized dish and I was pleased with it. For my entree, I chose the Tagliatelle Bolognese ($17), a meat ragout over egg noodles. I enjoy a good Bolognese sauce and this dish was very tasty, with plenty of meat, good spices and the tagliatelle was cooked just right. It was a decent sized portion and the price is on par with other high end Italian restaurants. I also got a side of the Lemon Fries ($6), matchstick fries with lemon salt. I was a bit leery of these, worried that the lemon might be too overpowering. Yet my fears were unwarranted. The fries were thin and crispy, cooked just right, and the lemon flavor was very mild. I would order these again. Service was very good. The restaurant was fairly busy again, indicating that this place seems popular. I will return again to try more dishes and continue to assess their consistency. Toro: Give Me More Corn!